The State Troopers PBA works hard to serve and protect its members who work hard to serve and protect you. In addition to seeking fair wages and benefits for our members, the union challenges unfair and unproductive working conditions as well as coercive and destructive management practices of the Division of State Police through grievances, Improper Practice charges, lawsuits and other methods to fight for our members’ rights. Since danger is inherent in the duties of Troopers, the PBA makes it a priority to monitor safety conditions and equipment such as patrol cars, portable radios and bulletproof vests and to seek better solutions for our members. Informing the public of the everyday heroism shown by Troopers as well as the issues the PBA is addressing on behalf of our members is important. The PBA routinely issues press releases and holds press conferences, and the union has achieved unprecedented success in advising the media of problems facing our Troopers. In addition to appearing on television news reports and being interviewed for print news publications across the state, the PBA has even been covered by the Associated Press news service and by national broadcast television network CNN. The PBA also calls upon its members to work together with the PBA as an organization to affect positive change. PBA members meet with New York State Senators, members of the Assembly, and the Governor, to discuss and promote legislation that will enable Troopers to more effectively carry out the missions to which they have dedicated their lives. 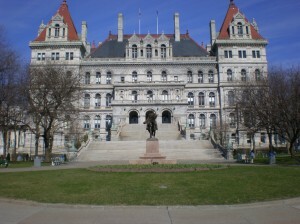 The New York State Capitol, where PBA members meet with elected officials and lawmakers to gather support for legislation, programs, and resources that will help New York State Troopers better serve the public.